accommodate supporting all types of shop platforms. Meylah, and more, including our original support for Zazzle! I will not be changing it for at least one very good reason. 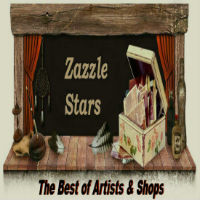 log in and add all your pertinent shop and artist information to your profiles. Members are also NOT forced to add any shops during sign up, as our goal here now is to create our own little marketplace of artists shops and members. There are new sections added, such as the Design Studio, where members can request designs or get help for their shops, and also a coding section has been started, with a little trick of my own added to help you make your shop threads on Zazzle Stars as unique as you are! The best way to see what is happening, and participate in our own little relaunch, is to log in and get exploring. Share the site with your friends and family, whether they are shop owners or not. You can use this website as a base for pushing your promotions all over the internet, the share features here are fabulous. If you need help, or have questions, just post them, or PM me, help is on the way. If you find something not working correctly, please let us know.